Pole position sitter Jaume Masia has taken his debut victory in the Moto3 class at the Argentine Grand Prix, not making life easy for himself after dropping back in the early stages to outside the top twenty before working through the field to take the win from Darryn Binder and Tony Arbolino, a debut podium for all three. Local favourite Gabriel Rodrigo looked set to take his first win in front of a home crowd, but it wasn't to be for the Argentine racer, lucky to stay on through the final complex to finish sixth behind Niccolo Antonelli and Ayumu Sasaki. John McPhee looked strong through the race, even leading on occasion, but was forced out of contention when he was hit by Alonso Lopez, severing his rear brake line and forcing him to crash in the next corner - taking down Lopez with him. Fellow Brit Tom Booth Amos had a strong outing in his second race, though, coming home just outside the points and leading the second group on track in 18th. Jaume Masia has taken his debut pole position ahead of tomorrow's Argentine Grand Prix, holding off Aron Canet and Tony Arbolino for the top spot. Canet ended up 0.319 behind Masia after working his way forward from Q1, while Arbolino finished only 0.028 behind the Max Racing KTM rider. John McPhee will finish the day disappointed with 11th place after topping most of the weekend’s action so far – but remaining confident with his race pace for tomorrow’s 21-lap battle. His fellow Brit Tom Booth Amos will line up in 27th in what could be a wet race if the forecast is to be believed. Scotsman John McPhee has topped the opening day of Moto3 action at the Argentine Grand Prix, ending the day’s final session 0.079 ahead of Tony Arbolino and Niccolo Antonelli. Setting his times alone on the Petronas Sprinta Honda machine instead of waiting for a tow from the pack, the 2017 podium finisher and pole position man at the Termas de Rio Hondo circuit was the man to beat. Speaking afterwards, he said: "I'm very happy. I had a good feeling and a good pace from FP1 onwards, and we didn't have to make changes to the bike because it worked very well. In FP2 we have used new tyres, with which I was able to set a good time. In Qatar we had good potential, but we never had a good enough feeling to take advantage of it. Now it seems that everything is coming together and we can ride better. Finishing the first day with the best time is a great way to start the weekend, but the most important part is still to come. If we keep working like this, we can have an exciting weekend." Local Gabriel Rodrigo was fourth, ahead of Tatsuki Suzuki and Aron Canet, with Dennis Foggia, Jaume Masia, Vicente Perez and Raul Fernandez rounding out the top ten. McPhee’s fellow British racer Tom Booth-Amos, a rookie to the Argentine circuit, was 29th on the CIP Moto KTM machine. 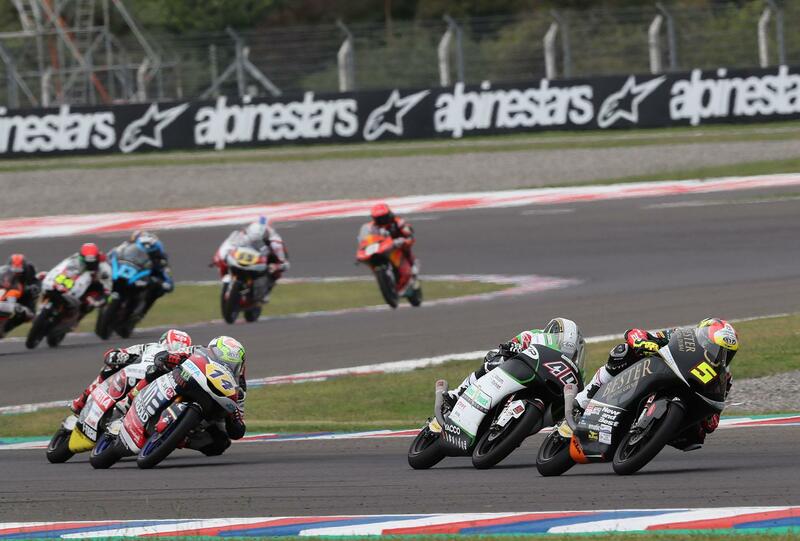 Action is underway for this weekend's second round of the 2019 Moto3 season, with free practice today at the Termas de Rio Hondo circuit in Argentina. Seeing Japanese rider Kaito Toba looking to defend his victory in the first race of the year, but up against fierce opposition, it's almost certain to be a close weekend. Also looking for a better weekend will be British rider John McPhee, looking to bounce back after suffering a technical problem in Qatar two weeks ago. Showing strong pace at the Losail circuit and with good results in the past at Termas, he told MCN yesterday that he's looking forward to returning to the front. "Over the last two weeks I have been sticking to my usual training programme to make sure I stay fit and ready. I have also had the chance to spend some good time with my friends; it has been a nice few days but now I can’t wait for the next race. I really like the circuit in Argentina. It is not too technical but it is very flowing. Two years ago I set pole position there and finished on the podium in the race. It is a circuit that suits my riding style, because it is flowing and fast. "I have been analysing the race from Qatar and there are some little areas I can improve in. The most important thing this weekend will be to try and get directly into Q2 and make sure of a good grid position to have a strong race."